NEMCO Motorsports’ NASCAR Camping World Truck Series History at the Phoenix International Raceway ... This weekend will mark NEMCO Motorsports’ seventh NASCAR Camping World Truck Series start at the 1.022-mile track. The organization posted a team best finish of second-place with John Hunter Nemechek on November 13, 2015. John Nemechek was the first to post a NASCAR Camping World Truck Series start at the Avondale, Ariz.,-facility for NEMCO Motorsports in 1995. Six starts at the Phoenix International Raceway have earned NEMCO Motorsports an average starting position of 14.0 and an average finish of 10.5. NEMCO Motorsports’ NASCAR Camping World Truck Series History ... Since entering the NASCAR Camping World Truck Series in 1995, the Mooresville, N.C.,-based organization has logged 129 starts from six drivers, resulting in strong performances that include six victories (Watkins Glen, Chicago, Atlanta, Canada, Gateway, and Iowa) and 27 top-five finishes, as well as 57 top-10 finishes, with an average starting position of 14.3 and an average finishing position of 14.2. NEMCO Motorsports Collectively … In this season's 21 events, NEMCO Motorsports' two NASCAR Camping World Truck Series entries have posted two victories (Gateway and Iowa), eight top-five and 11 top-10 finishes. The NEMCO Motorsports-prepared Chevrolet Silverados have completed 3,360 laps and have lead 108 of those laps. John Hunter Nemechek and Joe Nemechek rank sixth and 29th respectively in the NASCAR Camping World Truck Series driver points. All in the Family … Team owner Joe Nemechek has found success in the NASCAR XFINITY Series (NXS) in the “Valley of the Sun” with one top-five and two top-10 finishes in 15 starts. In 28 starts at the Phoenix International Raceway, Nemechek is credited with one top-10 finish in the Monster Energy NASCAR Cup Series (MENCS). In 1996, Nemechek posted his single NASCAR Camping World Truck Series start at the track, finishing in the eighth-place. John Nemechek had four starts at the Phoenix International Raceway in the NASCAR Camping World Truck Series. Vote for John Hunter Nemechek … Fans have the opportunity to make their voices heard by casting their votes to determine who will be the Most Popular Driver in the NASCAR Camping World Truck Series in 2017. Fans are able to cast their votes via http://www.nascar.com/mostpopulardriver from September 3 to November 16. Fans may select (1) candidate per ballot submission. Voting is limited to (1) vote per person per email address per day, per series. Fans selected John Hunter Nemechek as the 2015 NASCAR Camping World Truck Series Most Popular Driver. Meet John Hunter Nemechek … Fans can visit the Chevrolet Racing display located in the fan midway of the Phoenix International Raceway for a question and answer session with John Hunter Nemechek on Friday, November 10 at 12:45 p.m. (MT). Nemechek is scheduled to participate in an autograph session with the NASCAR Camping World Truck Series, located in the Phoenix International Raceway Fan Midway, from 1:00 p.m. to 1:45 p.m. (MT) on Friday. This Week's NEMCO Motorsports Chevrolet Silverado at the Phoenix International Raceway ... John Hunter Nemechek will pilot Chassis No. 042 in the Lucas Oil 150 at the Phoenix International Raceway. The Gere Kennon-led team last unloaded this NEMCO Motorsports prepared chassis at the New Hampshire Motor Speedway on September 23, where they finished in the 20th-place after starting in the 14th-place. In the chassis’ 10 collective starts at the Gateway Motorsports Park, Iowa Speedway, Phoenix International Raceway, and the New Hampshire Motor Speedway with Nemechek, the chassis has an average finishing position of 8.4. Sound the Alarm … The NEMCO Motorsports No. 8 Chevrolet Silverado returns with the Fire Alarm Services, Inc., (FAS) brand as the primary sponsor at the Phoenix International Raceway. Headquartered in Arvada, Colorado, Fire Alarm Services, Inc., provides superior fire and life safety and security services and products for protecting their client's real estate investment. In the “Valley of the Sun” ... This weekend marks John Hunter Nemechek’s fifth Phoenix International Raceway appearance with the NASCAR Camping World Truck Series. The Mooresville, N.C., driver has earned an average starting position of 11.0 and an average finishing position of 9.0 at the 1.022-mile track. Nemechek made his NASCAR Camping World Truck Series track debut on November 8, 2013. Speedway Stats: In 38 combined NASCAR Camping World Truck Series starts on speedways (tracks 1 to 2-miles in length), John Hunter Nemechek has recorded three victories (Chicago, Atlanta and Gateway), 11 top-five and 19 top-10 finishes. He has led for a total of 171 laps on NASCAR’s speedway tracks. Race Rewind: Phoenix International Raceway … John Hunter Nemechek, driver of the No. 8 Fire Alarm Services, Inc., Chevrolet Silverado for NEMCO Motorsports, finished in the sixth-place in the NASCAR Camping World Truck Series Lucas Oil 150 at the Phoenix International Raceway on November 11, 2016. 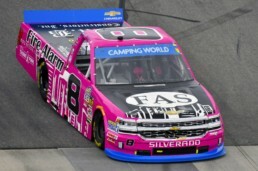 Nemechek started the 150-lap event from the sixth-place, and the 19-year old raced to the fifth-place by Lap 140, and ultimately finished in the sixth-place, maintaining his position in the closing laps. In the Rearview Mirror: Texas Motor Speedway … John Hunter Nemechek, driver of the No. 8 Fire Alarm Services, Inc., Chevrolet Silverado for NEMCO Motorsports, scored a 19th-place finish in the Jag Metals 350 NASCAR Camping World Truck Series race on Friday, November 3, at the Texas Motor Speedway. Nemechek started in the 11th-position in the 32-truck field. The 20-year old finished Stage 1 in the fifth-place, on Lap 35, and Nemechek was in the 10th-place by Lap 70. The team’s variant pit strategy placed Nemechek as the leader on Lap 127. Nemechek’s No. 8 Chevrolet Silverado ran out of fuel on Lap 134 after leading eight laps. He headed to pit road for fuel, and then upon exiting pit road, Nemechek received a pass-thru penalty by NASCAR for speeding while exiting. Under green flag conditions, Nemechek was scored two laps down in the 18th-place. With seven laps remaining in the 147-lap event, Nemechek was unable to gain positions in the remaining laps, and crossed the finish line in 19th-place. Season-to-date … Through the first 21 NASCAR Camping World Truck Series races of the 2017 season, John Hunter Nemechek has completed 2632 of 3148 laps contested (83.6 percent) and has led 108 laps. Nemechek is currently sixth in the driver point standings and sixth in the NASCAR Camping World Truck Series owner points. In addition, the NEMCO Motorsports driver has collected two victories (Gateway and Iowa), seven top-five and 10 top-10 finishes, has spent 2,096 laps running in the top 15 and has made 623 green-flag passes thus far this season. NEMCO Motorsports’ NASCAR Camping World Truck Series History at the Texas Motor Speedway ... This weekend will mark NEMCO Motorsports’ ninth NASCAR Camping World Truck Series start at the 1.5-mile track. The organization earned a team best finish of third-place at the Fort Worth, Texas-facility with Joe Nemechek on June 6, 2014. Eight starts at the Texas Motor Speedway have earned NEMCO Motorsports an average starting position of 15.2 and an average finish of 11.9. NEMCO Motorsports’ NASCAR Camping World Truck Series History ... Since entering the NASCAR Camping World Truck Series in 1995, the Mooresville, N.C.,-based organization has logged 127 starts from six drivers, resulting in strong performances that include six victories (Watkins Glen, Chicago, Atlanta, Canada, Gateway, and Iowa) and 27 top-five finishes, as well as 57 top-10 finishes, with an average starting position of 14.3 and an average finishing position of 14.0. 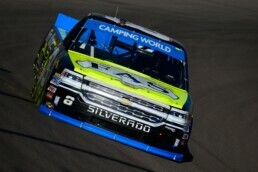 Collective NEMCO Motorsports … In this season's 20 events, NEMCO Motorsports' two NASCAR Camping World Truck Series entries have posted two victories (Gateway and Iowa), eight top-five and 11 top-10 finishes. The NEMCO Motorsports-prepared Chevrolet Silverados have completed 3,208 laps and have lead 100 of those laps. John Hunter Nemechek and Joe Nemechek rank sixth and 28th respectively in the NASCAR Camping World Truck Series driver points. Catch the Action ... The JAG Metals 350 Driving Hurricane Harvey Relief will be broadcast live on FS1 on Friday, November 3 starting with the pre-race show at 7:30 p.m. (ET). It will also broadcast live at 7:30 p.m. (ET) on the Motor Racing Network (MRN) and SiriusXM NASCAR Radio. Qualifying for the 21st event of the 2017 NASCAR Camping World Truck Series schedule will airFriday at 4:00 p.m. (ET) on FS1. This Week's NEMCO Motorsports Chevrolet Silverado at the Texas Motor Speedway ... John Hunter Nemechek will pilot Chassis No. 041 in the JAG Metals 350 Driving Hurricane Harvey Relief at the Texas Motor Speedway. The Gere Kennon-led team last unloaded this NEMCO Motorsports prepared chassis at the Las Vegas Motor Speedway on September 30, where they finished in the eighth-place after starting in the 15th-place. In the chassis’ nine starts at Charlotte (N.C.) Motor Speedway, Texas Motor Speedway, Kentucky Speedway, Pocono (Pa.) Raceway, Michigan International Speedway and the Homestead-Miami Speedway with Nemechek, the chassis has an average finishing position of 13.8. Sound the Alarm … The NEMCO Motorsports No. 8 Chevrolet Silverado returns with the Fire Alarm Services, Inc., (FAS) brand as the co-primary sponsor at the Texas Motor Speedway. Headquartered in Arvada, Colorado, Fire Alarm Services, Inc., provides superior fire and life safety and security services and products for protecting their client's real estate investment. "Deep in the Heart of Texas" ... This weekend marks John Hunter Nemechek’s fifth Texas Motor Speedway appearance in the NASCAR Camping World Truck Series. The Mooresville, N.C., driver has earned an average starting position of 15.5 and an average finishing position of 14.2 at the 1.5-mile track. Nemechek made his NASCAR Camping World Truck Series track debut on November 6, 2015.